Information Technology is the life-blood of every business organization. Regardless of size, maximizing up-time and minimizing service work ensures that your systems support your employees instead of hindering them. Our team of technicians and engineers understand this and work hard everyday to provide the highest level of service and support to each and every customer. Need new technologies deployed? No problem! Our consultants and estimators will take a truly consultative approach to solving your IT needs and will custom design solutions that not only solve your immediate needs but are sustainable into the future. There is no such thing as a one-size-fits-all solution. Every business is different which means that every company can benefit from a truly consultative approach towards providing technology solutions and recommendations. Finding out how you do business is the only way that we can truly provide lasting solutions that enhance your business and help make you more successful. Interested in experiencing this fresh and innovative approach to IT Consulting? 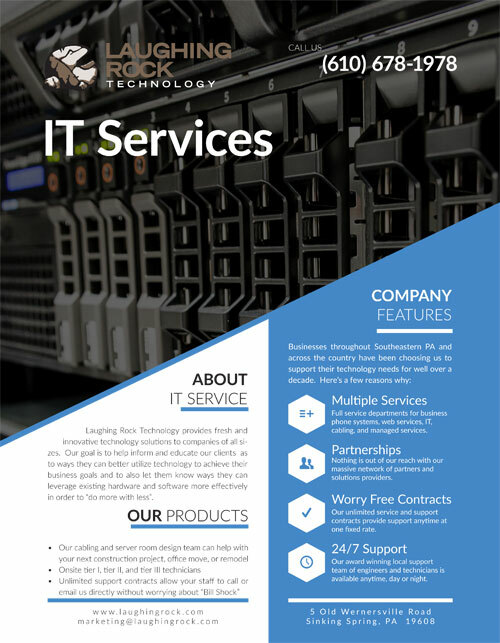 Contact us today and take advantage of our FREE technology review of your company. We work with companies of all sizes including small businesses, mid-market, and enterprise. Our goal during these reviews is to help inform and educate you as to ways you could better utilize technology to achieve your business goals and to also let you know ways you can leverage existing hardware and software more effectively in order to “do more with less”. Contact Us today to schedule your free evaluation today! Proudly Serving Customers in Berks County, Lancaster County, Lehigh Valley, Chester County, Montgomery County and Schuylkill County PA including Reading, Lancaster, Allentown, Pottstown, Pottsville, Collegeville, Kutztown, King of Prussia and beyond.